A regular breeding resident and migrant; birds are occasionally observed during the winter months. The Short-eared Owl was rare during the Minnesota Breeding Bird Atlas (MNBBA). Global in distribution; North American breeding populations are distributed across Canada and the northern United States, where they are found from northern California east to the Great Lakes. Populations reach their highest breeding densities in southern Alberta (Figure 1). Assigned a Continental Concern Score of 12/20 and identified as a Common Species in Steep Decline by Partners in Flight; officially classified as a state Special Concern Species in Minnesota and listed as a Species of Greatest Conservation Need by the Minnesota Department of Natural Resources. Populations in Canada and the very northern tier of the United States are largely migratory, moving south in the winter to the southern states and northern Mexico. The species, however, tends to be nomadic, following the irruptive populations of its favorite food, Microtus voles. As a result, birds that move south in the winter may find abundant food sources that entice them to stay for the following breeding season and abandon sites further north. Alternatively, they may leave well-known breeding sites in the summer because food is limited and move to sites with more suitable prey populations (Wiggins 2004; Wiggins et al. 2006). Feeds primarily on small mammals. Although Microtus voles constitute a major portion of its diet, this owl also feeds on a variety of other animals including shrews, pocket gophers, moles, field mice, and birds. A small depression scraped in the ground and lined with grasses and downy feathers. Breeding distribution and relative abundance of the Short-eared Owl in North America based on the federal Breeding Bird Survey from 2011 to 2015 (Sauer et al. 2017). In his 1932 treatise on Minnesota birds, Roberts described the Short-eared Owl as “an inhabitant of the marshes and low-lying fields throughout Minnesota.” It was considerably more abundant on the western prairies, and less commonly but “generally distributed in the forested area wherever there are extensive marshes.” He suspected the owl migrated southward during the winter months yet still described it as a permanent resident. Breeding evidence was documented in four counties: Grant (young nearly full-grown), Jackson (nest with eggs), Meeker (nest with eggs), and Polk (nest with eggs). Among the few summer reports compiled by the Minnesota Ornithologists’ Union from 1932 until Green and Janssen published their updated accounts in 1975, the majority of detections were from western Minnesota. 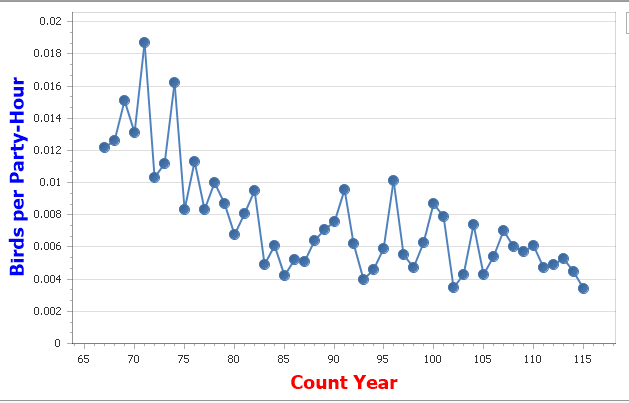 The exceptions were six records from St. Louis County (all summer observations), one record from Lake County (a summer observation), and one record from Aitkin County (a nesting record in 1974; Johnson 1982). As Roberts had noted earlier, the birds were also reported during the winter months. Whether these were resident birds or migrants from further north was unknown. In 1975 Green and Janssen had little new information to report regarding the species’ breeding status other than to clarify that there were no breeding season reports from the Twin Cities or the southeastern region of the state. The species was most abundant in the west-central and northwestern regions but appeared to be declining in numbers in the years just before publication. Janssen’s updated account in 1987 had no new information beyond that which Johnson had presented several years earlier. Although Johnson delineated a total of 15 counties where nesting had been confirmed, Janssen identified only 6 where nesting had been confirmed since 1970: Beltrami, Chippewa, Hubbard, Lake of the Woods, Rock, and Roseau. Hertzel and Janssen (1998) later published an updated map of confirmed nesting records since 1970. It also included six counties but had eliminated the records from Chippewa, Rock, and Roseau Counties and replaced them instead with records from Aitkin, Lac qui Parle, and Marshall Counties. To date the Minnesota Biological Survey has reported a total of 20 breeding season locations for the Short-eared Owl. Of these, 5 records were from Aitkin County; the remainder were from Otter Tail County (1 record) and from several counties in the far northwest region, specifically Lake of the Woods, Marshall, Pennington, Red Lake, and Roseau (Minnesota Department of Natural Resources 2016). During the MNBBA, observers tallied a total of 47 Short-eared Owl records in only 41 of the surveyed atlas blocks and in 24 of the priority blocks. Breeding was confirmed in 7 blocks (Figures 2 and 3; Table 1). The birds were reported from 13 of Minnesota’s 87 counties and were confirmed breeding in 5 counties (1 record was on the Polk/Marshall county line, where the young were reported on both sides of the road and county line). Of the confirmed breeding records, 3 counties were additions to the list published by Hertzel and Janssen in 1998: Kittson, Pennington, and Polk. Aside from a few recent reports in the southwestern corner of the state, the records were confined to Aitkin County and to four counties in the Aspen Parklands. Should be noted that Short-eared Owl pairs have territories every two square miles throughout the area. Only the highest breeding evidence code recorded, but Short-eared Owls seen each visit (near daily). Estimated 5 pairs in the block, all south of the Marshall/Polk County line; 4+ in areas immediately adjacent to block (primarily south and east). It is difficult to discern if the current distribution of the Short-eared Owl differs from that described by Roberts nearly a hundred years ago. Further east, the species’ range has receded in New England, where it originally nested in at least eight states. Now it is present in only three: Massachusetts, New York, and Pennsylvania. Further south, the species’ increasing presence in southern Florida is thought to represent colonization northward from Cuba. The Short-eared Owl population on the island increased in numbers and expanded in distribution as the cultivation of rice, sugar, and citrus fruits increased in the late 1900s, providing a more abundant and stable prey base. This, in turn, may have forced younger birds to disperse north to southern Florida (Wiggins et al. 2006). Closer to home, in the Upper Midwest and across the Great Lakes, it is difficult to interpret changes in abundance and distribution noted by some atlases, especially in light of the species’ nomadic tendencies and sporadic breeding. Studies in Alaska, for example, have shown a tight correlation between breeding densities and prey abundance (Wiggins et al. 2006). Breeding distribution of the Short-eared Owl in Minnesota based on the Breeding Bird Atlas (2009 – 2013). Summary statistics of observations by breeding status category for the Short-eared Owl in Minnesota based on all blocks (each 5 km x 5 km) surveyed during the Breeding Bird Atlas (2009-2013). Summary statistics for the Short-eared Owl observations by breeding status category for all blocks and priority blocks (each 5 km x 5 km) surveyed during the Minnesota Breeding Bird Atlas (2009-2013). Although there have been few quantitative studies, all accounts described the Short-eared Owl’s breeding habitat as open country. Given the species’ wide distribution, the range of habitats occupied is quite diverse and includes tundra, sagebrush prairie, native grasslands, retired cropland, and wet meadows (Wiggins 2004; Wiggins et al. 2006). In Minnesota the species is primarily an inhabitant of grasslands, wet meadows, and open peatlands (Figure 4); Conservation Reserve Program (CRP) grasslands also are occasionally used (Hanowski 1995). Some agricultural lands are used, including hayfields and fallow stubble fields, but the birds avoid sites that were grazed (Kantrud and Higgins 1992; Fondell and Ball 2004). The species is also strongly associated with large, unfragmented landscapes. In North Dakota the Short-eared Owl was rarely observed on sites that were less than 100 ha. Although it may use smaller tracts, such sites are often embedded in a much larger grassland landscape (Dechant et al. 2001). The most important criteria governing habitat selection may be prey densities: when food is abundant, smaller sites may be deemed more suitable. In the Dakotas, the Short-eared Owl is most frequently associated with sites where the herbaceous vegetation ranges from 30 to 60 cm in height and has not been burned or mowed recently. Residual vegetation accumulated over a period of two to eight years was preferred (Duebbert and Lokemoen 1977). In Wisconsin, the birds were found on sites where the vegetation ranged in height from 70 to 90 cm (Evrard et al. 1991). Typical breeding habitat of the Short-eared Owl in Minnesota (© Lee A. Pfannmuller). Unfortunately the only long-term data set available for North American breeding birds, the federal Breeding Bird Survey (BBS), is not well suited for most birds of prey because they are not vocal or easily observed. As a result, projected population trends lack precision. Regardless of the BBS’s limitations, it remains one of three primary sources that suggest a long-term population decline for the Short-eared Owl (Booms et al. 2014). The downward trend was particularly steep in Canada and the Prairie Potholes Region that straddles both Canada and the northern United States. Specifically, BBS data from Canada show a significant decline of 6.51% per year from 1966 to 2015; in the Prairie Potholes Region the data show a significant decline of 4.07% per year. By contrast, South Dakota is the only locality in North America where BBS data demonstrate a positive population trend, increasing at a rate of 4.58% per year (Sauer et al. 2017). Data collected in Minnesota were too sparse to provide any reliable trend information. Overall, using BBS data, Partners in Flight has estimated that the Short-eared Owl population has declined in North America by approximately 65% since 1970 (Rosenberg et al. 2016). Christmas Bird Count (CBC) data provide another lens into the species’ status, focusing instead on the distribution and abundance of birds from mid-December through early January. CBC data collected from 1966-2014 across Canada and the United States also demonstrate a clear decline in numbers (Figure 5). Indeed, the number of owls counted per party hour has declined approximately 50% in the United States and 80% in Canada since 1966 (Booms et al. 2014). These two quantitative monitoring programs are complemented by numerous conservation assessments of the species’ status at the regional, state, and federal levels. Drawing on the knowledge of local natural resource professionals and the larger birding community, each program lends further support to other observations of the species’ long-term decline (Booms et al. 2014). Biologists have also used the BBS data to generate a North American population estimate of 660,000 breeding adults (Rosenberg et al. 2016). In 2013, Minnesota was estimated to support approximately 0.8% of the North American population (Partners in Flight Science Committee 2013). Applying that percentage to the 2016 number yields an approximate statewide population of 5,500 breeding adults. Number of Short-eared Owls reported on Christmas Bird Counts in North America from 1966–2014 (National Audubon Society 2016). Assigned a Continental Concern Score of 12/20 (Rosenberg et al. 2016), the Short-eared Owl has been recognized by numerous federal and state resource and conservation organizations as a species in decline. It recently was identified as one of 24 Common Species in Steep Decline by Partners in Flight (Rosenberg et al. 2016). In Canada it is a Species of Special Concern, and it is officially listed as Endangered in 12 eastern states. The U.S. Fish and Wildlife Service has designated it to be a Bird of Conservation Concern in five of their seven administrative regions (Booms et al. 2014). It has been officially classified as a Special Concern Species in Minnesota since 1984 (Coffin and Pfannmuller 1988) and is designated a Species of Greatest Conservation Need because of its rare, vulnerable, and declining habitat (Minnesota Department of Natural Resources 2015). An ecologically vulnerable species, the Short-eared Owl’s dependence on large, unfragmented grasslands has been and remains the most significant threat to its status. Given its nomadic behavior and its reliance on high rodent populations, broadscale conservation efforts that focus on grassland conservation across multiple landscapes are critical. The cooperative efforts of many regional Joint Ventures, as well as Minnesota’s own Prairie Landscape Initiative (Minnesota Prairie Plan Working Group 2011), are examples of the breadth and intensity of work that is needed to ensure the species’ future. In particular, it is essential that remaining tracts of grassland in the Aspen Parklands, the region most critical to the Short-eared Owl, are protected. Finally, although the Short-eared Owl’s future is strongly associated with the future of grassland habitat, the impact of climate change on the species status also has been examined recently. In a comprehensive review of 588 North American birds, the National Audubon Society assessed the impact of warming temperatures on each species’ distribution. Their modeling exercise predicted that climate change could result in a loss of nearly three-quarters of the species’ current winter range in the United States, resulting in its classification as a “climate endangered” species (Langham et al. 2015; National Audubon Society 2016). Clearly, the Short-eared Owl’s future is at stake on many fronts. Dechant, Jill A., Marriah L. Sondreal, Douglas H. Johnson, Lawrence D. Igl, Christopher M. Goldade, M. P. Nenneman, and Betty R. Euliss. 2001. Effects of Management Practices on Grassland Birds: Short-Eared Owl. Jamestown, ND: Northern Prairie Wildlife Research Center. http://digitalcommons.unl.edu/usgsnpwrc/136. Duebbert, Harold F., and John T. Lokemoen. 1977. “Upland Nesting of American Bitterns, Marsh Hawks, and Short-eared Owls.” Prairie Naturalist 9: 33–40. Evrard, James O., DeWayne A. Snobl, Paul B. Doeneir, and Jill A. Dechant. 1991. “Nesting Short-eared Owls and Voles in St. Croix County.” Passenger Pigeon 53: 223–226. Fondell, Thomas F., and I. Joseph Ball. 2004. “Density and Success of Bird Nests Relative to Grazing on Western Montana Grasslands.” Biological Conservation 117: 203–213. Hanowski, JoAnn M. 1995. “Breeding Bird Composition and Species Relative Abundance Patterns on Conservation Reserve Program (CRP) Land in Western Minnesota.” Loon 67: 12–16. Kantrud, Harold A., and Kenneth F. Higgins. 1992. “Nest and Nest Site Characteristics of Some Ground-Nesting, Non-Passerine Birds of Northern Grasslands.” Prairie Naturalist 24: 67–84.